Contact collaboRATE if you are considering a translation. 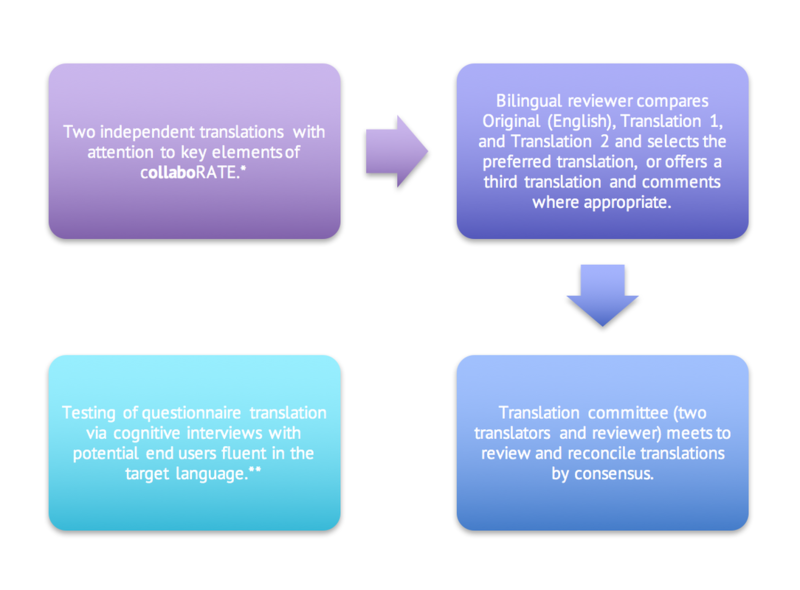 Translations of collaboRATE should adhere to the following process to ensure consistency among versions of the questionnaire. These guidelines are drawn from those developed by AHRQ’s CAHPS II Cultural Comparability Team  and are consistent with leading translation methods in the survey research field. While backward translation is suggested by some sources [3,4], it is not a required component of the collaboRATE ​translation protocol. *While no guidance is provided on the required credentials of the independent translators, we encourage the selection of individuals who are suitably qualified. No specific expertise in health care is required. **Cognitive interviews with the target population may shape the extent to which Key Elements guidelines (below) are practicably applied to the final translation. collaboRATE was designed to be a brief patient-reported measure of shared decision making (SDM). The three items represent the three core SDM activities: 1) explanation of the health issue, 2) preference elicitation, and 3) preference integration. collaboRATE was deliberately worded in response to feedback gathered through cognitive interviews with members of a hospital population (see Elwyn et al, 2013). Translations should allow for cultural adaptations needed for clarity, while prioritizing a high degree of fidelity to the original English version of the measure. We recommend that you read the paper published by Elwyn et al. describing the development of collaboRATE as this will provide further detail regarding the rationale behind collaboRATE items. 1 Weidmer B, Hurtado M, Weech-Maldonado R, Ngo-Metzger Q, Bogen K. Guidelines for translating CAHPS Surveys. Rockville, USA: AHRQ 2006. https://cahps.ahrq.gov/Surveys-Guidance/Helpful-Resources/Resources/Guidelines_Translation.pdf (accessed 13 May 2014). 2 Survey Research Center. Guidelines for best practice in cross-cultural surveys. Ann Arbor, USA: Survey Research Center, Institute for Social Research, University of Michigan 2010. http://www.ccsg.isr.umich.edu (accessed 13 May 2014). 3 Mokkink L, Terwee C, Patrick D, Alonso J, Stratform P, Knol D, Bouter L, de Vet H. The COSMIN checklist for assessing the methodological quality of studies on measurement properties of health status measurement instruments: an international Delphi study. Qual Life Res 2010;19:539–49. 4 Beaton D, Bombardier C, Guillemin F, Ferraz M. Guidelines for the process of cross-cultural adaptation of self-report measures. Spine 2000;25:3186-91. 5 Elwyn G, Barr PJ, Grande SW, Thompson R, Walsh T, Ozanne E. Developing CollaboRATE: a fast and frugal patient reported measure of the shared decision making process in the clinical encounter. Patient Educ Couns 2013;93(1):102-107.